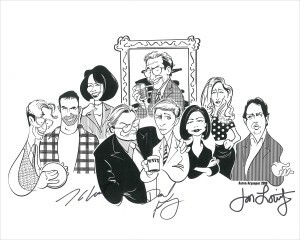 When I discovered Saturday Night Live for myself, “my cast” included Dennis Miller, Dana Carvey, Jan Hooks and the power-duo of Phil Hartman and Jon Lovitz. Growing up as a fan of the show (and almost everything that that crew would go on to do – I was the kid who dragged his poor family to the theater to see Mom and Dad Save the World), I never thought I would ever get a chance to meet any of them. I got my opportunity when Jon Lovitz headlined the Addison Improv five years ago this very week. When you start out in stand-up, it’s enough just to get work at the club. You don’t get much say in who you work with. You don’t get much work, period. Sometimes the headliners bring their own supporting acts, but mostly the club matches up who they think would make a decent fit for a great show. As a newer comic, your job is to be the best version of you you can be while somehow also being as “decent a fit” with as many different comics possible (more flexibility gets you more stage time, and more stage time makes you a better comic which gets you more stage time and so on). Mr. Lovitz was a bit aloof when I first met him, and I worried that he was going to keep his distance the whole weekend. I quietly introduced myself, told him that I was looking forward to the shows, and then left the green room. Yeah, I did know. And I almost cried. It was a great weekend. When it has gone well, there’s sometimes an awkward “end of the date moment” after the last show…something along the lines of, “Well, this was fun. We should do it again sometime.” The hope is that a headliner takes SUCH a liking to you, recognizes your comedic genius, and decides that you NEED to be their permanent opening act on the road. The reality is usually just a handshake. You might exchange email addresses. You may actually email each other. I realized I was rehearsing and then performing a small “sketch” with Jon Lovitz for no one but myself and Jon Lovitz. And maybe because he always seemed like a such a Simpsons/Critic cartoon of a personality to me anyway, I thought the story could use a visual. You really need to hear the story in his voice, but the comic strip might help a bit.